CSM Hoyt "Whip" Wilson was born July 25, 1931, in Hall County, Georgia and grew up on a farm. 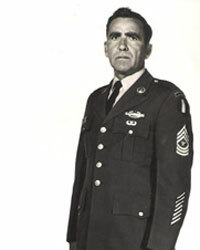 He joined the U S Army in 1948, for a 3-year hitch that turned into a dedicated 26 year career, retiring in 1974, with the rank of Sergeant Major E-9. He graduated in the second Ranger School graduating class in March, 1952, when the camp was just that - a camp of tents at what is now Camp Glisson. Out of his Ranger Class of 136 students, only 36 graduated with the Ranger Tab. He served combat tours in Korea and Viet Nam, and received numerous decorations including the Purple Heart. SGM Wilson was wounded at Heartbreak Ridge, and he spent three months in a hospital in Japan - then was sent back to his frontline unit. SGM Wilson served thirteen years at Camp Frank D Merrill with duties as a Ranger Instructor, NCOIC - patrolling committee, and Camp Sergeant Major. He ended his military career by serving a tour in the ROTC program at North Georgia College and State University. SGM Wilson was referred to as "Whip" - a nickname he was always known by; its origin is unknown. Whip was one of a kind. He loved being an Airborne Ranger and he led by example as a Ranger Instructor and Camp Sergeant Major. SGM Hoyt "Whip" Wilson was known throughout the Army for his work ethic, integrity, personal strength, humility and his dedication to duty. After his retirement, Whip served again at Camp Merrill, working for DOD at the Motor Pool. He was an active member of American Legion Post #239 in Dahlonega, Georgia. Whip passed away on October 3, 2010, at age 79 and is greatly missed by his family and comrades who served with him. Whip Wilson is a role model for others to follow. His footprints will always remain in the Ranger Training areas of the North Georgia mountains. Whip, thanks for your dedicated service to our nation.